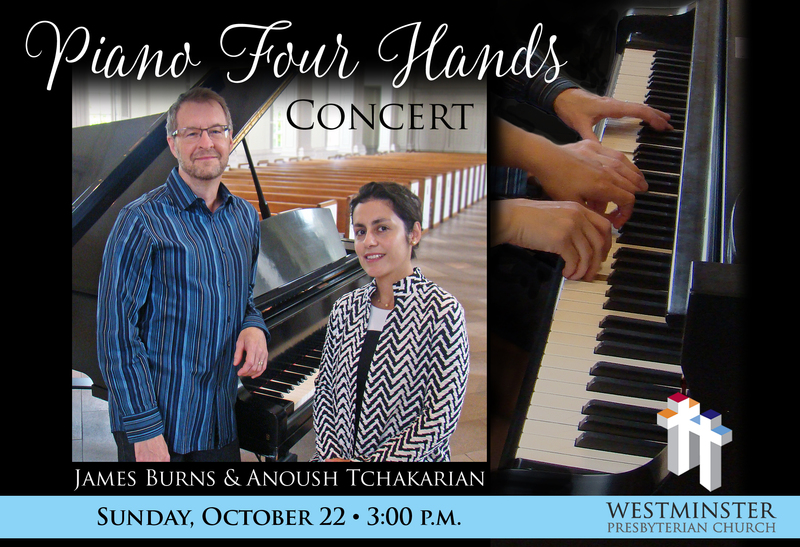 Adjunct Professor of Piano, ANOUSH TCHAKARIAN will perform in a special concert hosted by the Westminster Presbyterian Church on Sunday, October 22 at 3:00 p.m. As part of the church's Music and Arts series, this particular recitals is titled Piano Four Hands and will also feature alumnus James Burns (M.M. Sacred Music, 2015). Hailing from Sofia, Bulgaria, Tchakarian has been playing piano since she was four years old. By five, she was accepted into a school for gifted children at the music school Lubomir Pipkov. She holds a bachelors degree from the Sofia Conservatory and a masters and artist diploma from Duquesne University. Since graduation, she has been a member of the faculty at both the Mary Pappert School of Music as well as its community music division, City Music Center. Only one week later, on October 29, Tchakarian will be featured on a faculty recital by our very own Ken Burky. That recital will take place at 3:00 p.m. in the PNC Recital Hall. To read more about Anoush Tchakarian, please visit her faculty profile page.